Richly rendered orange buff brick, foaming terracotta tiles, smoothed lengths of limestone, a marble monument that literally reflects a Renaissance master in artistic precision and aesthetic exactitude. From without, the vernacular Lombard Romanesque church – also known as First Romanesque, a style manifested in Lombardy (Northern Italy) in the 10th and 11th centuries and characterized primarily by blind arcades along gables, parapets and campaniles – is aglow in an orange and blond matrix of brick and limestone. 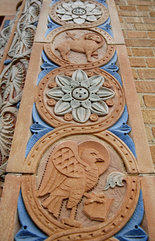 A central raised arched doorway is outlined by floral keystones, a pattern repeated in a seemingly continuous course without and within. Ten tall arched window openings fenestrate the east and west walls of the church. Two square towers with stone arcade balustrades on each side break into octagonal belfries roofed with Lombardic terracotta tiles. The Claremont Avenue facade is a vernacularized classicism, a bold bow to Italian antiquity. But a different architectural order is at work on the inside. The shallow foyer opens to an immense column-free sanctuary – an engineering feat made possible by advances in structural steel construction. In the 1930s, Modernism was finding its way into historicist architecture; century-old architectural anatomies like slender pillars and towering triforiums were slowly being eradicated for more simplistic layouts that allowed clearer views of the chancel and increased light penetration. 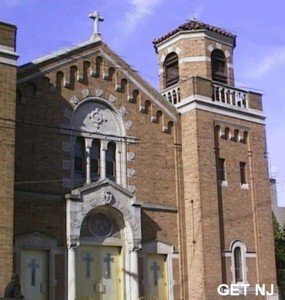 At its unveiling in 1935, Our Lady of Sorrows was considered to be Jersey City’s first unobstructed church interior and hence one of its earliest Modernist edifices. 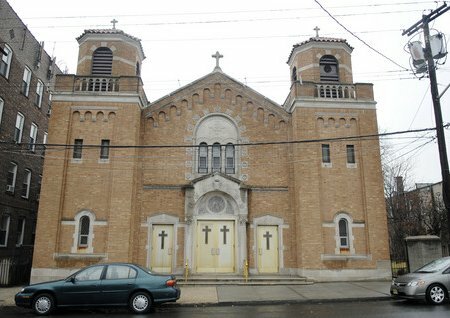 The prominent Italian-American architect Anthony J. DePace designed a single gaping space under a low ceiling that culminates at shallow proscenium-arched transept alcoves and a main ciborium altar backed against a sheer plaster wall. From John Gomez in The Jersey Journal, March 12, 2009. 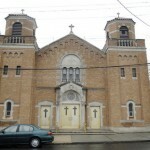 The church was built by Auriemma and Macchi Construction Company. 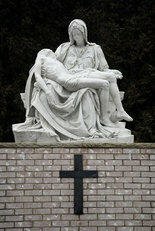 1940 – Copy of Michelangelo’s Pieta. A single block of white Carrara marble was sculpted by Trevi Studios of Rome, Italy. John M Anzivino on February 23, 2017 at 4:58 pm. 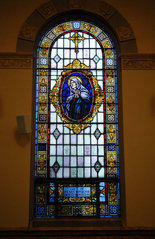 One of those stained glass windows has my grandfather’s name on the ventilation panel. His name is Michael Tuzzo. I never knew him as he passed before I was born, but my grandmother always remembered him in prayer and spoke of him to us youngsters too. Antoinette Franchesca Auriemma Vespa on October 17, 2015 at 1:59 pm. My grandfather is Leopold Joseph Auriemma! I am his proud granddaughter .It gives me such a feelong of pride that this became such a historial landmark! I enjoyed reading your article!